These days, we're seeing Western-inspired items on our favorite fashion bloggers, on the runways or even on our friends, and we don't think twice about it. OK, maybe we do when we're deciding if we could pull off the bandana-around-the-neck look, but after that, we just accept the trends and swipe our credit card to purchase that fringe crop top from H&M's Coachella collection. As we know, and as we've seen over and over again, history repeats itself. These styles had to come from somewhere. Millennials, as creative as we are, didn't invent the eye-catching belt buckle. And we certainly didn't come up with the bolo tie ourselves. Long before fringe became a staple at musical festivals, and decades prior to cowboy boots becoming the must-have item for Luke Bryan concerts, historical and Hollywood figures had the Wild West look on lock. Annie Oakley rocked the cowboy hat around 100 years before Carrie Bradshaw showed up in one (and you know the exact outfit I'm talking about). 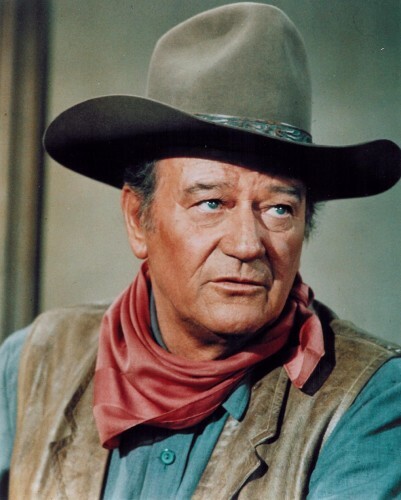 John Wayne's popularity probably has something to do with the fact that Urban Outfitters is able to charge $12 for a bandana. And females in sundresses have to thank the Brits, oddly enough, rodeos and Tom Cruise (kind of) for the perfect footwear for summer cookouts. Yeah, we've seen these looks go in and out of fashion, but instead of praying they don't go out of style, let's take a look back at the history behind your "trendy" wardrobe pieces. Shockingly, cowboy boots have a bit more history to them than Taylor Swift in her Nashville country music days. Many sites attribute the creation of the cowboy boot, at least partially, to the Wellington, named after the Duke of Wellington, the Hessians or the Huns. The Wellington boot was a far cry from the ostentatious Ariats or Tony Lamas you can find today. It's simple: a straight back, plain leather and a 1-inch heel. That's it. If the Brits contributed the general shape, the Hessians added to today's common look with the scalloped or V-cut front. On the other hand, the Huns are sometimes reported as the first group to use stirrups while riding horses, so boots were required. A higher heel and pointed toe made the ride a heck of a lot easier because they prevented the rider's foot from sliding in and out of the stirrup. Over time, and as Hollywood, fans of the rodeo and shoemakers really caught on to the whole idea of the flashy boot, one with colors, designs and even rhinestones, the fashion statement grew into what we're familiar with today. The history of the bandana varies. Some sources say the roots of the red dye and iconic paisley print trace back to India 200 years ago. Others say the bandana became popular as a symbol of independence in America. Pirates even supposedly brought the bandana across the Atlantic. Any and all of these could have some truth to them, but there are two reoccurring ideas: usefulness and Hollywood glamor. The bandana used by real cowboys and ranch hands was never about fashion. It wiped the sweat off your face and protected you from sunburn during a long day moving cattle. It served as a backup stirrup or a makeshift bandage if a branch sliced your arm as you rode through the woods. If you planned on robbing a bank, it was your disguise. It could do basically everything Urban Outfitters wouldn't want you doing with that expensive piece of cloth you just had to have. We didn't truly see the emergence of the iconic red bandana, however, until the Wild West movies hit their streak of popularity. From there, John Wayne, Rosie the Riveter and Tupac all found unique ways to keep the bandana trend going. Fringe is a divisive topic: You either love it or you hate it. Either way, it's made appearances in almost every style in nearly every decade. Elvis and Jimi Hendrix rocked fringed jackets. John Galliano and Derek Lam incorporated fringe into their collections and on the runway. The flappers of the 1920s danced the Charleston in dresses dripping in fringe. Your sister bought a fringe bag at Zara yesterday. But nope, we can't credit the style to any of them. All the credit here goes to Native Americans. Tribes across the country used the embellishment to adorn ceremonial garb and as a way to repel rainwater from clothing. Terrified of getting your suede fringe jacket wet? Well, that's probably because it isn't made out of real buckskin. Often known by other names -- western tie, cowboy tie, string tie, etc. -- the bolo tie comes with a questionable past. The Navajo Indians are said to have first worn some form of the bolo tie. But like they are wont to do, white Americans had to come in and take the idea for their own. Victor Cedarstaff is also credited as a catalyst for the bolo tie; some sources call him the "father of the bolo tie." As lore tells it, the Arizona man was scared of losing his silver-trimmed hatband, so he put it around his neck. He patented the idea in the 1950s. And the rest, including the fact the bolo tie became Arizona's official neckwear in 1971, is history. Last but certainly not least is the belt buckle. According to TrueCowboy.com, a reliable source if I've ever heard of one, the "shiny belt buckle" wasn't really a cowboy thing until the movies made it one in the 1920s. Suspenders or belts sans the buckles were used instead. So as many times as we search "cowboy belt buckle" in the ASOS search bar, it really isn't accurate. But "belt that's only popular because of the Western movies" might not yield as many results. Although the belt buckle, just like every other trend, has a detailed and confusing past, it can't be talked about without mentioning rodeos and bull riders. Instead of massive trophies that will collect dust, personalized belt buckles are given to rodeo champions. They're usually inscribed with the names of the event, the dates and possibly the riders' names. Luckily for us, we don't have to become really good at steer wrestling or barrel racing to land the perfect belt buckle for a pair of high-waisted jeans. We can go shopping.